KIAWAH ISLAND, SC � If there�s one thing to be said about all of the east coast�s super-luxury golf resorts, it�s that they�ve got first-class sleeping accommodations and fine dining to go along with their pristine links of emerald green. The grand entranceway to The Sanctuary. 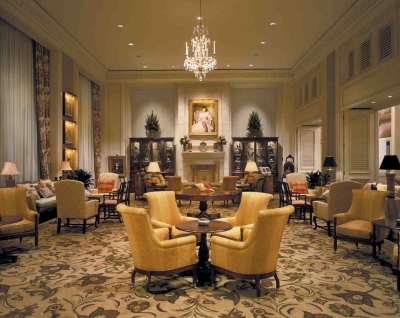 Or how about Pinehurst, the �Home of Golf,� with its grand Carolina Hotel? 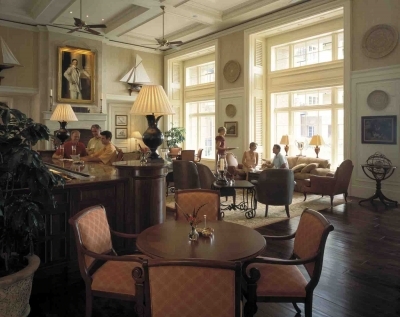 The common denominator for all these destinations is a hotel with distinction. You can offer all the great golf in the world, but if there isn�t a plush place waiting to pamper your players, then you can�t be mentioned with the elites. You�re doomed to merely having incredible golf. 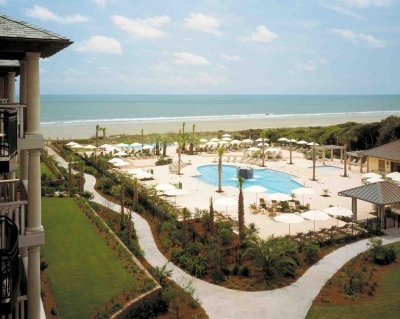 That was the situation at Kiawah Island Golf Resort, at least until last August (2004), when its new hotel, The Sanctuary, opened its opulent doors for the first time. �But we also recognized that we were missing the ultra high-end accommodations that the luxury golfer has become accustomed to at other places, such as Pebble Beach or Pinehurst. 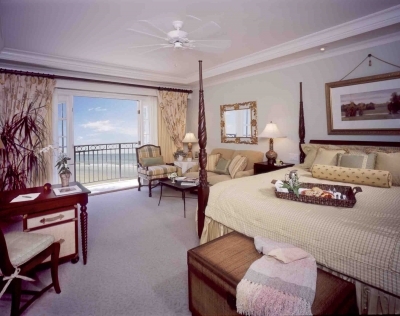 We knew we needed a better hotel accommodation than the original Kiawah Island Inn,� Devadas added. Looking towards The Sanctuary's pools. It�s one thing to assess a situation, it�s quite another to commit the time and resources to building the vision. Almost a decade later, The Sanctuary completed its 255 guest rooms and suites, pools, restaurants and spa to the tune of $125 million. That�s not a typo, folks. With that kind of price tag, you�d almost expect The Sanctuary�s entranceway to be carpeted with green portraits of Ben Franklin, but the d�cor, needless to say, wows you just the same. The hotel is designed to reflect the style of a grand southern seaside mansion � and we�re glad to say, even Scarlet O�Hara would probably find its hallways very comforting and homey (complete with grand staircase, patterned after the one that was used in �Gone With The Wind�). �And because of that long period of development, we really had a chance to put a lot of thought into how people would use it. We were interested in becoming an American icon, much as The Greenbrier has been in another generation. So, we planned for the type of hotel that, even fifty years from now, would be considered really special,� Devadas proclaimed proudly. 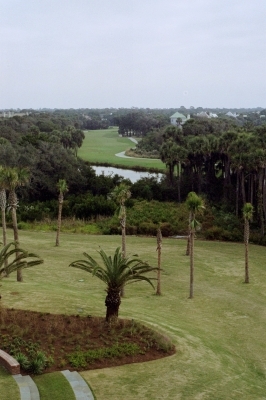 You can see the Turtle Point Course from many of The Sanctuary's guestroom balconies. Photo By Kevin Gaydosh. That meant making the hotel experience a bit less like a hotel, and a bit more like staying as a guest in that fine southern mansion that we talked about above. The guest rooms are a good bit larger than a typical resort guestroom, and the bathrooms are much more luxurious that the typical resort guestroom. No doubt about it, a space you�ll want to spend time in for something other than sleeping. Devadas said they, like every developer, considered making the rooms smaller for economic reasons, but felt very strongly that ten, twenty or fifty years from now, they wanted The Sanctuary to still be considered at the high-end of luxury. How�s that for planning beyond the next fiscal quarter? As nice as the sleeping rooms are, the entire �mansion� and grounds of The Sanctuary received the same kind of aristocratic attention. The lobby is something to behold � open and airy, with high ceilings, hardwood flooring, theme-appropriate furnishings and sparkling chandeliers. The hotel is located on a pristine stretch of South Carolina beach, and you can literally stroll out the rear exit and rub your toes in the sand within a matter of seconds. Of course, you can also spend time at the pool(s) or in the Spa. Another choice would be to enjoy some quiet reflection on your room�s private deck, overlooking the beautiful ocean setting or the finely manicured grounds. The Kiawah folks even went to the trouble of transplanting mature trees to give the hotel the look and �feel� of a place that�s been around a lot longer than a few months. The Sanctuary may not enjoy the years of history as some of the others do, but it�s got the �look� just the same. Perhaps one of the nicest things about The Santuary is its resort-like atmosphere, but at the same time, preserving a relative sense of privacy. 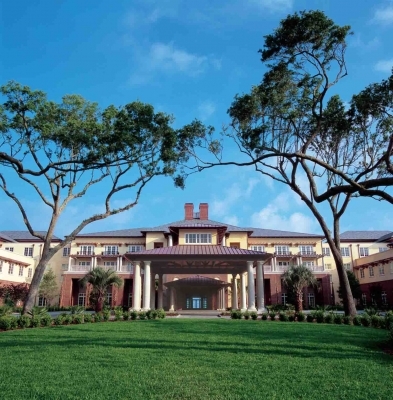 Kiawah Island offers a 10-mile stretch of beach, but The Sanctuary is the only hotel. 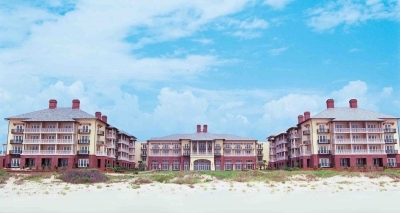 There are condos and homes along the shore, but no one will mistake this for Myrtle Beach � or even Hilton Head Island. Standing on the beach, this is the view you'll have of The Sanctuary... the ocean's just behind you. Charleston�s about a half-hour up the road, and it�s true, there�s a multitude of activities to partake in there � the history alone is worth an extended stay. But that�s only if you�ll want to do it, because staying at The Sanctuary is haven enough for just about anyone. Luxury defined. You won't want to go home. Unfortunately for us, The Sanctuary was completely sold out when we visited the island. Though our Kiawah experience wasn�t quite as luxurious as it would�ve been had we stayed at the new hotel, it was plenty well appointed and comfortable � if not a bit more convenient and private. We stayed in a villa (there are also private homes available for rent through the resort), complete with full kitchen, a deck and short walk over the dunes to the beach. As we often like to do when traveling, lodging with the comforts of home is something not to be discounted � we were able to enjoy quiet evenings near the ocean without the �you have to do something� feeling sometimes associated with staying at a once-in-a-lifetime type hotel accommodation. That�s not to say we won�t be trying out The Sanctuary at some future time. But for this past visit, the villa experience was just as comfortable, indeed. Note: Check the links below for more stories on the golf experience at Kiawah Island, including reviews of four of its courses. Telephone numbers below, in the �rates� section.